A new cave diving book by Duncan Price recounts his 30-plus years exploring places few of us will dare to go. In a sport that most non-divers consider ‘extreme’, the world of the cave diver is perhaps that ultimate pinnacle. In many ways it is the unglamorous side of the sport. Deep wreck divers loaded with hi-tech gear get to freefall to a dark world, and return to tell human stories – they are setting the historical story straight. Cavers are the true explorers, who visit places no human has ever been before. They are connecting with the natural world in its most extreme form. Unlike the clarity of deep water, a life underground is a muddy, strenuous, dangerous one full of intuition and guesswork. Duncan Price knows all about it. Like many of us he was drawn to the water as a child, but more unusually fell in with a cave exploration group at university and spent his leisure time digging, scrambling (and finally swimming through sumps) when he should’ve been drinking in the union bar. It quickly spiralled into an obsession, driven in part by the realisation that opening up the furthest reaches of any cave system required not only digging, but diving. Caves are almost always created and managed by water. Almost all have tunnels partly submerged (sumps), and may contain pools or waterfalls within their vast systems. Part of the glory of caving (your face on the cover of ‘Caver’ magazine, presumably) is the idea of linking up different cave systems. This may involve digging spoil from blocked tunnels, diving through unexplored ones and even using explosives to open new ones. To explore so far underground requires expeditionary planning and nerve to pull off. Cavers like Duncan need to be expert explorers but also managers, technicians, climbers and even athletes – some of his trips last days beneath the surface. Beer plays a part in many of Duncan’s tales from his decades in the sport. There are scrapes (being locked in a cave and forgotten about overnight), run-ins with the authorities (concern over explosives in an underground mine) and brushes with disaster. Even in the underrepresented sport of scuba diving there are few household names, but the two best known cavers (Martyn Farr and Rick Stanton) are Duncan’s friends and crop up frequently. The book will appeal to the technically minded, too. Back in the 1980s, Duncan began diving with little more than the best wetsuit he could afford and a single cylinder on his back. Cave divers as much as any group were quick to embrace the rebreather, and Duncan made his first forays into CCR in the 1990s. 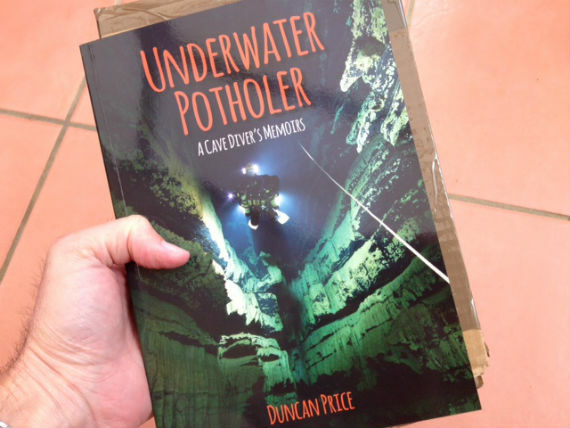 Underwater Potholer is a substantive piece of work written in an accessible way. It oozes with passion for a sport that is mysterious and largely ignored by the public, business and mainstream media. Duncan Price’s book shines some much-needed light on his underground world.